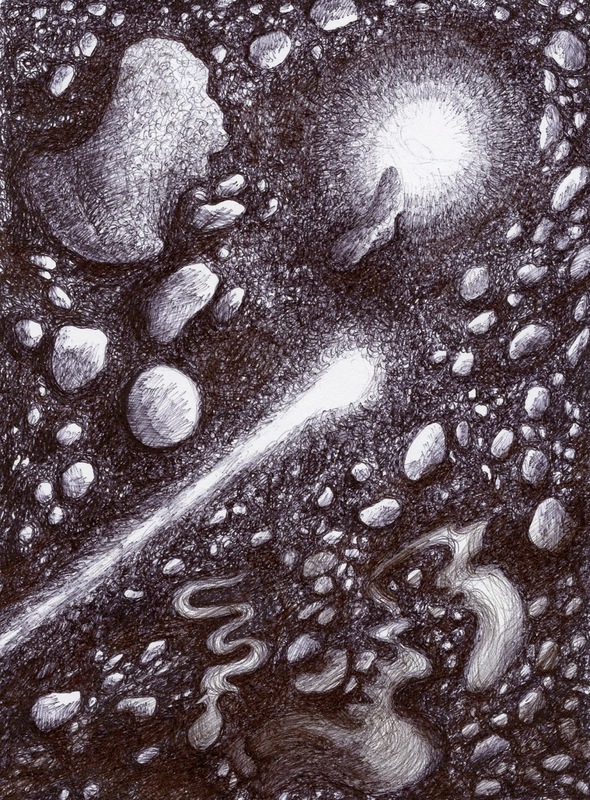 I have just been drawing asteroids with a ball point pen, after the Horizon programme featuring the dangers of small asteroids to our planet, shown again on Thursday 12th February. This was of special interest as the Society of Graphic Fine Art’s optional theme for its 94th Open Annual Exhibition at the Menier Gallery in Southwark, London is ‘Time and Space’. I’m still thinking about the time part! The images reminded me of pebbles on the beach, some smooth some rough, and that space has its own texture, more granular than the imagined homogeneous void. I drew various shapes while viewing, then worked into the shapes, the small tool disallowing any homogeneity and resulting in a rather organically grained surface.